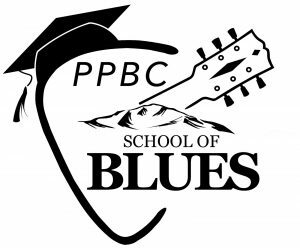 PPBC School of Blues is a non-profit, youth-artist development program sponsored by the Pikes Peak Blues Community with the mission, “Keeping the Blues Alive.” The School of Blues program has been created to provide opportunities for middle and high school aged musicians to play with other students in a performance band format. Through Blues Boot Camp workshops, led by professional musicians, School of Blues students will learn to perform a repertoire of blues music, along with learning the art of improvisation and solos. Workshops will focus on the methodology of rehearsals, techniques of jamming, on-stage communication, stage presence and performance. Student bands will have multiple performance opportunities at PPBC jams, concerts, festivals and events in and around Colorado Springs. Students will come away with an understanding of the structure and nuances basic to Blues Music. All participants will gain experience in the art of performing Blues Music in an ensemble setting, including jamming. This will encompass improvisation, song structure, chord comping, Blues rhythms, bass lines, performance techniques, vocal strategies and more. Blues Boot Camp is open to all 6th through 12th grade students. You do not have to be part of your school’s musical program. However, to gain the most from this experience, it is expected that students will have a basic understanding of their instrument. They should be able to identify the notes on their instrument, and in the case of guitar / piano players, be able to form chords. You are not required to read music. This is not meant to provide lessons on your instrument, but give you instruction to enhance your current abilities in a performance environment focused on Blues Music. Q: How will a day at Blues Boot Camp look? A: Camp will run from approximately 9:00 a.m. until 1:30 p.m. During that time a variety of activities will take place conducted by community blues musicians. Camp will open with a quick musical presentation representing the focus of the day’s activities. A short explanation and open discussion will follow. 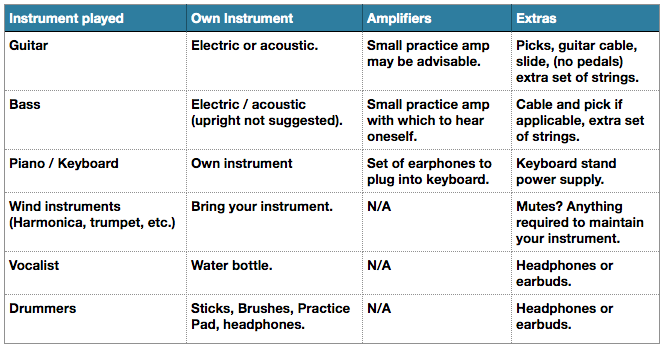 Students will divide into individual break-out sessions by instrument. Each break-out session will feature instruction, practice, and question and answers that center on various techniques common to the specific instrument. All students will reconvene for some overall discussion, and a question and answer session. After lunch students will cycle in and out of ensemble play. Throughout the day students will receive feedback and tips on technique, achieving their tone and their overall approach to the genre. Price for Boot Camp is $200. Checks should be made payable to Pikes Peak Blues Community. In order to gain the most from this experience you should be fairly proficient on your instrument. You should have a legitimate curiosity for Blues Music. You should have a desire to play in an ensemble format with other like-minded musicians. Lastly, a desire to learn from professional and semi-professional musicians is paramount. All students should come with an internet compatible device. It is our intention to distribute information electronically via a service such as Google Classroom. Students should also have a means of taking written notes (paper and pencil).